UPDATE: I actually made 2 errors with this post. I decided to correct them with a new post so you can see exactly what happened. See the mistakes I made in this post over here. One of my all-time favorite books for startups is Eric Ries’ The Lean Startup. I’m mostly in agreement with Ries on these two. You’re either going to have to pay for your customers or you’ll need to grow from word-of-mouth/viral invite systems. This applies to two types of businesses, subscriptions and user engagement. Software-as-a-Service companies use subscriptions so the longer people stay subscribed, the more money they make. For consumer tech companies like Twitter, Instagram, or Facebook, they rely on user engagement so they can monetize their users with ads. In both cases, the business benefits as users keep using the product over the long term. 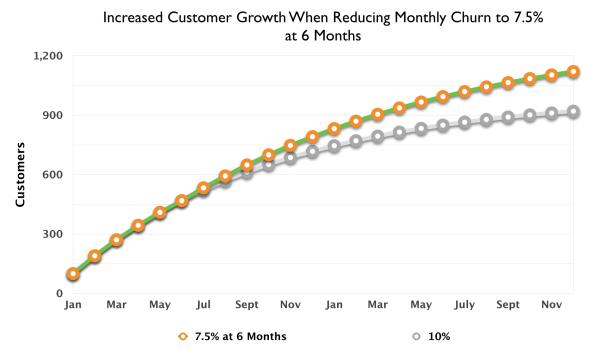 The strategy for this growth engine is pretty straightforward: reduce your churn to increase the value of your customers. You do this by keeping customers engaged and lowering the percentage that leave in any given month (your churn rate). But Ries’ Sticky Engine of Growth doesn’t actually produce growth that scales. Churn is not a path to growth. It simply raises your growth limit. It’s the ceiling that lets you keep playing. It buys you time and gives you more breathing room. But if you want hockey-stick growth, you’ll need to build another engine of growth WHILE attacking your churn rate. Here’s the problem: when you have a “sticky” business and need long-term customer engagement, churn puts your business into a constant rate of decay. Churn nips at your heels, rots your customer base, and will deadweight your company if you’re not careful. Early on, the 10% churn doesn’t really matter. Your 100 new customers easily make up for it. But once you get to 1000 customers, you churn rate equals your acquisition rate. Within 2 years, your business has stalled. In order to beat churn, you have to keep accelerating your growth. Even if you have 1-2% churn (the goal for SaaS companies), your growth will consistently slow down unless you build another engine to accelerate it. Churn doesn’t get you to the next level, it simply let’s you take another shot. See how you hit that next ceiling after an small spike? When people talk about growth from lower churn, it’s that initial spike since the growth rate now exceeds the churn rate. But it doesn’t take long for the new churn rate to catch up and stall the business again. No matter how low you get your churn, you’ll hit a cap sooner or later. Your growth will keep slowing down as every month goes by. The only way to accelerate growth is to build one of the primary growth engines: organic or paid. The reason that churn is so nasty is that it quickly scales to the size of your business. 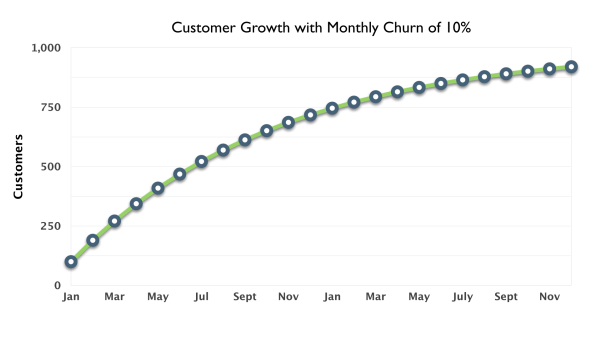 10% churn with 100 customers means that 10 customers left this month. If you somehow manage to get to 100,000 customers without addressing your churn, you’ll now be losing 10,000 customers each month. It’s fairly consistent all the way up. But marketing, sales, and growth systems don’t scale so easily. Paying for 10,000 new customers each month is an entirely different game than 10 new customers. Even viral systems don’t scale forever, they’ll start to slow and churn will catch up in a hurry. And don’t convince yourself that you can achieve some absorb churn rate like 0.1%. Top-tier SaaS businesses are in the 1-2% range, maybe as low as 0.75%. There are hard limits on how low you can go. Considering that most VC’s are looking for at least 100% year-over-year revenue growth rates for SaaS (consumer tech has even more absurd growth benchmarks), you need to build a growth engine that doesn’t mess around. I’ve spent 2 years understanding the growth model of a SaaS business at KISSmetrics. While churn is one of our top priorities, we wouldn’t get very far unless we committed to building an additional growth engine. That’s why we built out our marketing and sales teams. Maybe you double-down on product and customer service to accelerate word-of-mouth. If you’re in consumer tech, a viral invite system might work if it adds to the core value of your product. Or maybe you build a paid engine with content marketing and ad buys. Either engine can work. But you need to remember that growth won’t come just from lower churn. If you’re building a business that relies on keeping customers engaged over time, you cannot expect to grow your company from just a low churn rate. Churn is absolutely CRITICAL to the success of your business. But it’s only one piece of the puzzle. Look at any SaaS business that has IPO’d recently like Marketo or Box. They all have massive marketing/sales budgets. They’re even hemorrhaging cash to keep accelerating their growth rates. That being said, I DO agree with Ries that the primary goal of a sticky business model is to focus on customer retention. No subscription or engagement business is going to get very far unless they control their churn. You’ll hit a ceiling that won’t budge until you do. Before you can think about growth, you need to get your churn to acceptable levels. Or all your customers will leave just as fast as you acquired them. But once you have a low churn rate, growth isn’t going to magically appear. And a business looking for high rates of growth will need to acquire customers at scale. Raising engagement will increase the value of your current customers but it won’t necessarily bring you new customers. You’ll need to delight customers to the point that word-of-mouth and virality start working in your favor. Or you’ll need to start paying for customers. The primary benefit of sticky engines isn’t growth, it’s an increase in customer value. Any subscription or engagement business attempts to spread customer payments out over a long period of time. For many SaaS businesses, the goal is to keep customers subscribed for 24-36 months. By spreading payments out, you’re able to increase the value of your average customer. This is one of the main reasons that tech companies have moved to subscription payments instead of up-front software licenses. And consumer tech companies can monetize long-term, active users a lot easier with ad revenue. In fact, a well-executed upsell and churn reduction system can give you negative churn. This means the value of your current customers is increasing faster than the value lost from customers leaving. Your total customer count drops while your revenue increases slightly. Even if you don’t acquire any more customers, your revenue will still grow. At least in the short-term. But this isn’t considered a primary growth engine. It’s mainly a strategy to mitigate the impact of churn so you get the full benefit of your real growth engine. The revenue growth from negative churn pales in comparison to any half-decent growth engine. Negative churn will only give you marginal gains. Won’t Better Engagement Lead to More Word-of-Mouth and Virality? Word-of-mouth growth requires a level of engagement well beyond what it takes just to keep customers engaged each month. Providing enough value to keep customers interested is one thing, providing enough for them to drag their friends into the product is something else altogether. But you’ll need to perfect these tactics and delight your customers at a level well beyond what it takes just to reduce your churn. At that point, you’re deliberately pursuing an organic engine of growth. That being said, I’m a huge fan of Eric Ries’ book The Lean Startup. I definitely consider it one of the classics for startups. It’s a huge inspiration for my own work, I highly recommend it. Good points here Lars and super timely. I’ve been drafting a post on the 5 essentials for reducing churn for the Framed blog and your post here was a good reminder of how churn reduction fits into (or in this case, as an augmentation) to a product growth engine. First you need to distinguish between user growth and revenue growth – the 2 aren’t always lock step with each other. Next I view the sticky engine less as about churn (or even retention) but about the inverse: customer lifetime. Additionally, when you start thinking in terms of problems or jobs-to-be-done versus solutions delivered as a single product, the upside expands with this engine. If you only think about reducing churn with a single product perspective, yes it has a ceiling and will not be a firing rocket for all the reasons you describe. Even the best companies run into this ceiling. But the real upside is not from reducing churn for one product, but increasing the lifetime value you derive from customers (ARPU and LTV) which is multiplied when you employ a multi-product strategy. – Trust is already established, etc. Yes, revenue and user churn are two different things. In SaaS, revenue expansion can outpace churn to the point where you’re growing without needing to acquire any additional customers. But there are also limits to how far you can push LTV and ARPU. Churn is a good indication of how far you’ll be able to push either. If you don’t have product-market fit and an above average churn, you’ll have a pretty hard time convincing customers to upgrade or purchase additional products. But if you get the churn low enough, you’ll have a lot more flexibility on price and introducing secondary products. Everything works as a cohesive engine with world-class churn as the foundation. Also remember that new products won’t impact a business until the first product reaches a large enough scale so that purchases from your customer base can amount to a large enough amount to make a tangible impact. Previous customers always have a better conversion rate than brand new users. But there’s far fewer customers than there is people in your total addressable market. A 10% conversion rate from a customer base of 1000 is a fraction of a 1% conversion rate on an audience of 100,000 (100 new customers vs 1000 new customers). You’ll still need to reach a pretty large scale before additional products to current customers outweighs the impact from your normal acquisition funnel. And a world-class churn rate combined with a solid acquisition funnel is how you reach that scale. FWIW Ries didn’t say we need to focus only on the churn rate in the sticky model. He said to focus on the “compounding rate,” which Ries defined as the natural growth rate minus the churn rate.